Liquid error: Index was outside the bounds of the array. 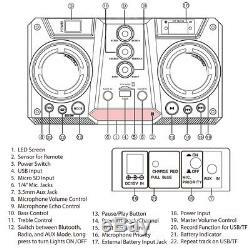 DOLPHIN SP-909RBT RECHARGEABLE BLUETOOTH PARTY SPEAKER LARGE & PORTABLE WITH LED. Volume, Treble, and Bass Controls. Neon Style Light & Woofer Lights with On/Off Switch. Main Channel: Bluetooth, USB, TF, FM, or AUX. Auxilliary Input: 3.5mm Jack. Two 1/4 Microphone Jacks with Volume and Echo Controls. Dual 8 Woofers with 19mm Voice Coils and 7.8 oz Ferrite Magnets. Built-In 4500 mAh 12V Acid Battery with Ext. Manual Language: English &ish. If your item is defective within the first 30 days of when it was delivered to you; you have the following options. We will send you a. To replace the item for a brand new one. If you want to return your item within the first 30 days of when it was delivered to you; you have the following options. This includes blown speakers with burned voice coils. The item "Dolphin SP-909RBT Rechargeable Bluetooth Party Speaker Large & Portable with LED" is in sale since Friday, July 24, 2015. This item is in the category "Consumer Electronics\Portable Audio & Headphones\Portable Stereos & Boomboxes". The seller is "zxuby_shops" and is located in Los Angeles, California. This item can be shipped to United States, Canada, United Kingdom, Denmark, Romania, Slovakia, Bulgaria, Czech republic, Finland, Hungary, Latvia, Lithuania, Malta, Estonia, Australia, Greece, Portugal, Cyprus, Slovenia, Japan, China, Sweden, South Korea, Indonesia, Taiwan, South africa, Thailand, Belgium, France, Hong Kong, Ireland, Netherlands, Poland, Spain, Italy, Germany, Austria, Israel, Mexico, New Zealand, Philippines, Singapore, Switzerland, Norway, Croatia, Brazil, Chile, Colombia.